You be careful out there folks! As long as I can remember I’ve always had a fascination with maps and plans. Understanding the ‘lay of the land’ so to speak. A map tells you not only where you are but also what is around you. 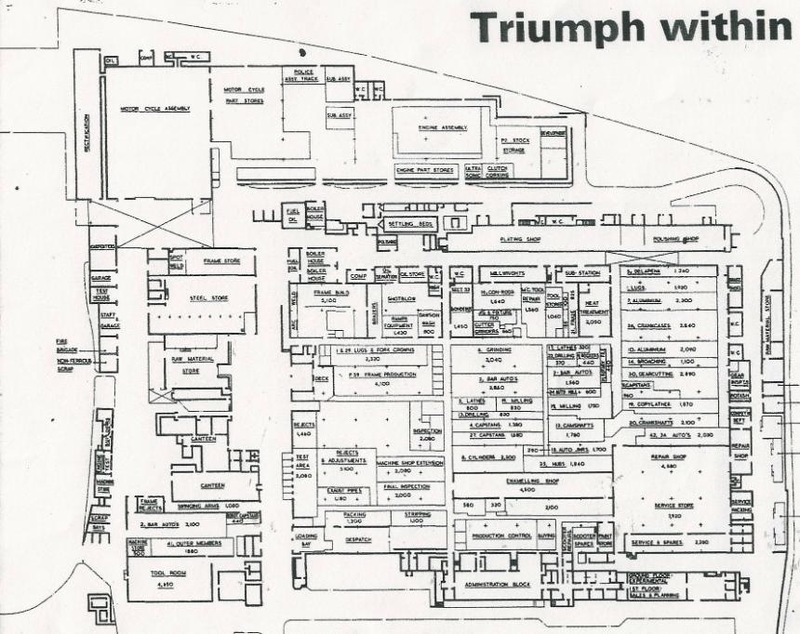 An Interweb search has recovered this factory plan of Triumph Meriden. In it you can see a fabrication and assembly process from raw materials, through machining, enameling, through to assembly and on to testing and despatch. 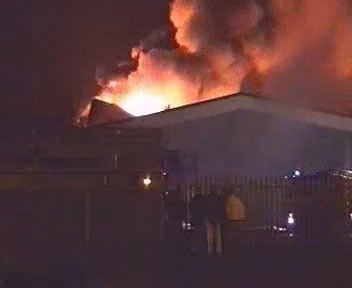 The repair shop is also there; so aftercare is within the factory. 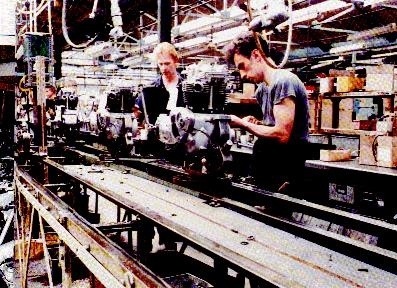 You can easily stroll the hallways smelling the oily swarf emu bating from the machine shops, fresh rubber tiles being mounted to finely tuned wheels and the first grunts of the bikes as they receive their life giving kicks by the testers. 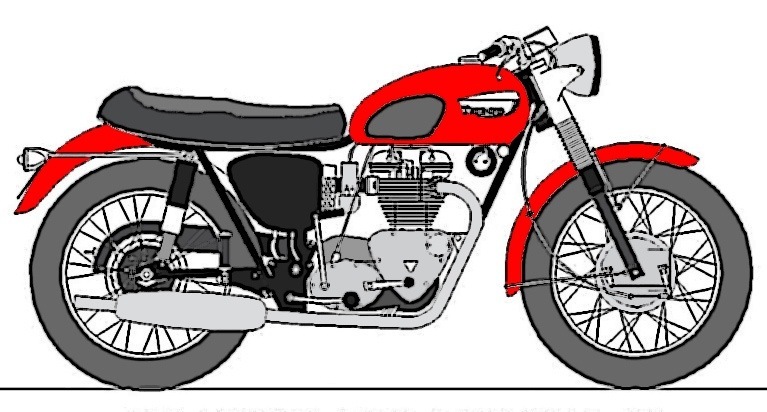 The ‘other’ motorcycle manufacturer that spanned the globe was BSA, who indeed at one point exceeded Triumph in the output of bikes. Birmingham Small Arms of course started as rifle makers before expanding into bicycles and finally ending up as The Worlds Best Motorcycle. 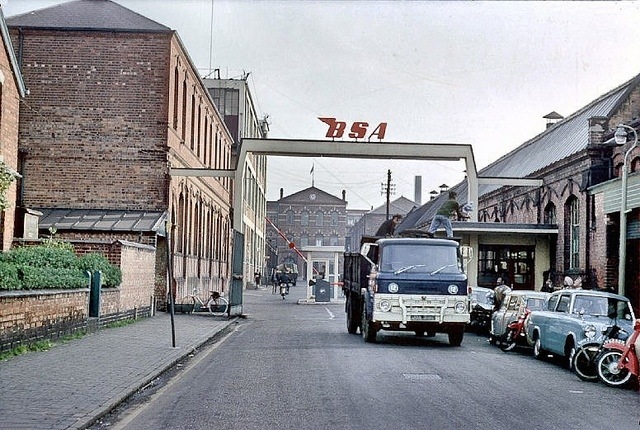 Here are some great historical images if their factory on Armoury Road at Small Heath near Birmingham. 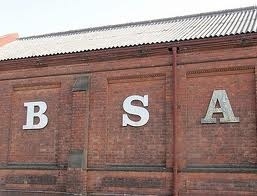 BSA on the old brickwork. 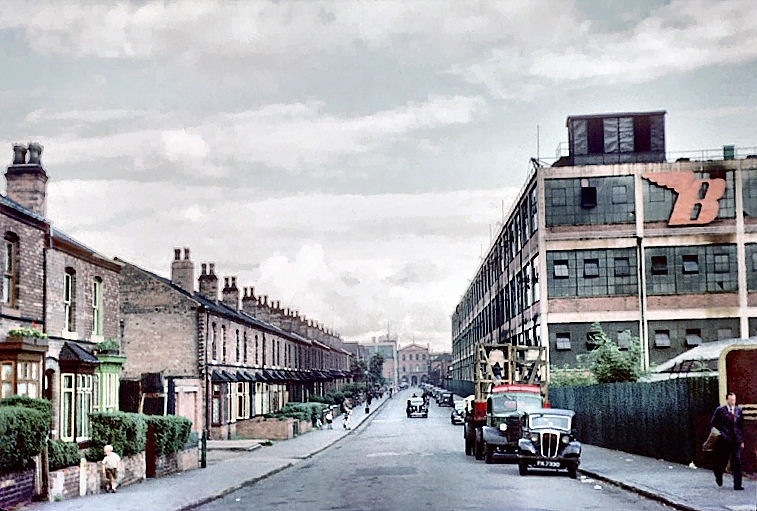 A view down Armoury Road shows the proximity of the factory to the neighbouring terraced housing. 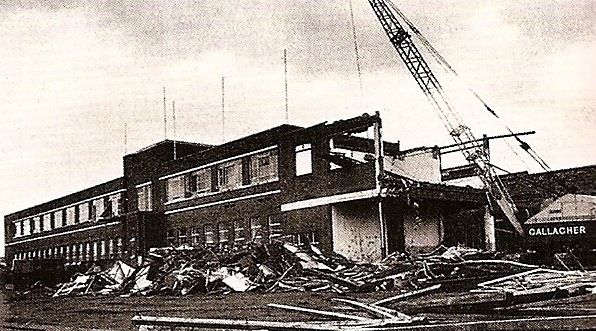 The feathered B evident on the factory itself. 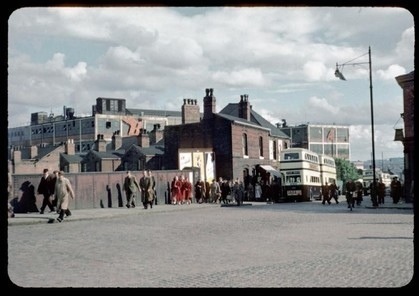 Factory workers line up for a bus, possibly just off shift or having just had a thirst quenching jar at the local pub. 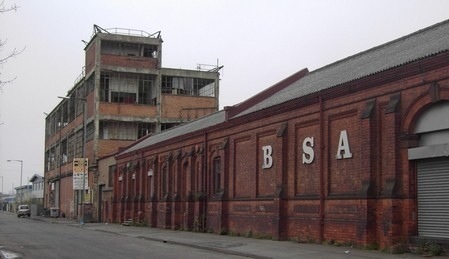 Only a part of the factory remains, now used for the manufacture of air rifles, full circle for BSA it seems. 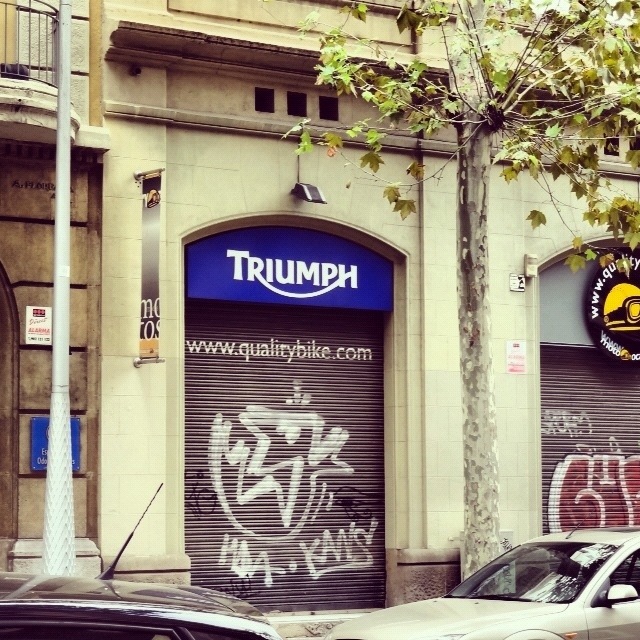 Can this name see a fresh dawn of motorcycles? With able craftsmen like Larry Houghton of Lamb’s Engineering and his fantastic ‘Son of a Gun’ custom Beeza the future could look bright! A litre sized Lightning, a nimble 500cc Goldstar, a 750 dual use Hornet… Give the Hinckley crowd something to think about eh? Triumph has arisen. 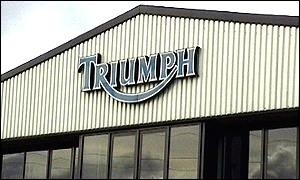 From the lows of the seventies and near comatose eighties the Triumph story has entered a new stronger and healthier chapter in its historied name. 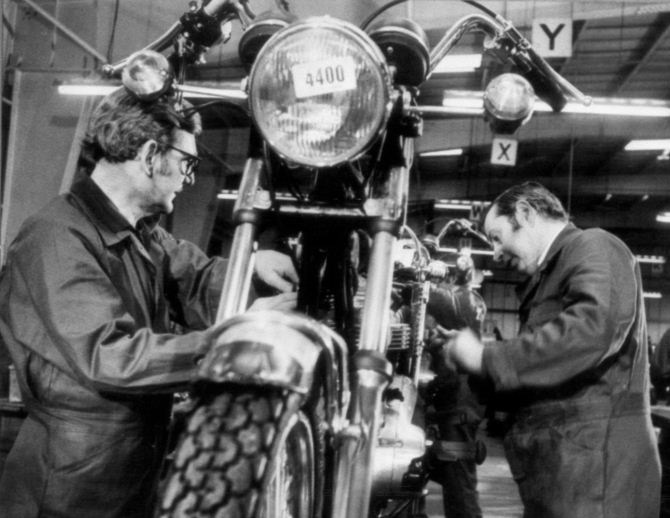 Meriden saw the workers fights for maintaining a motorcycle manufacturing heritage steeped in race victories, worldwide distribution, and a name to stand above the rest. However it was too little too late. 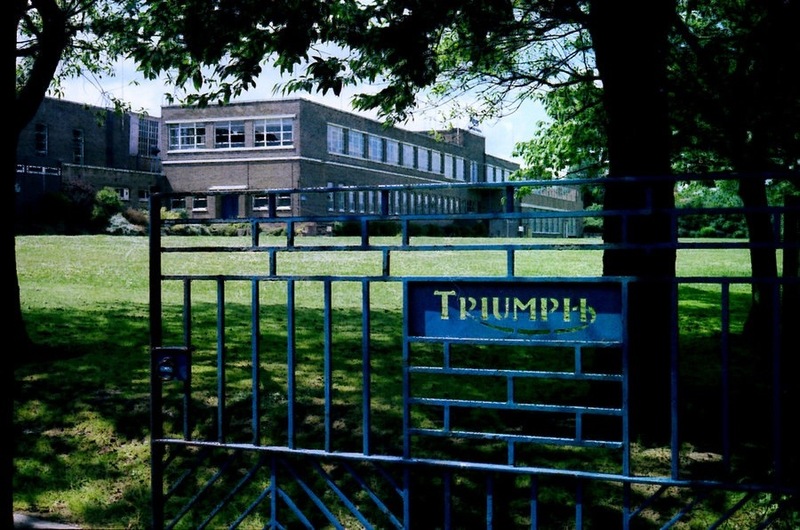 Like an ember hidden under the dead ashes of a hearth, the name Triumph wouldn’t die easily. 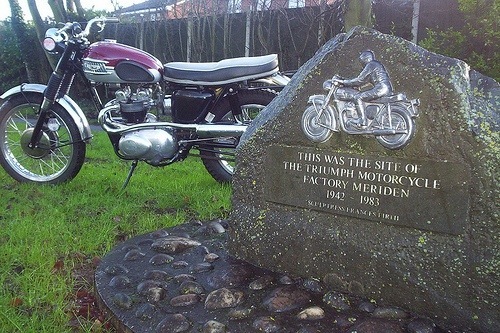 A monument stands on the site of the old Meriden factory; now surrounded by a housing estate with roads named: Bonneville Way or Turner Drive. 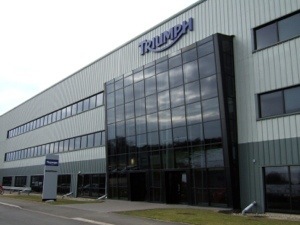 But for the last quarter century the rebirth at Hinckley under the directorship of John Bloor the Triumph name has gone from strength to strength; even after a factory fire in 2002. The new Hinckley plant is a glistening showcase of great British industry heading into another century of motorcycle greatness! 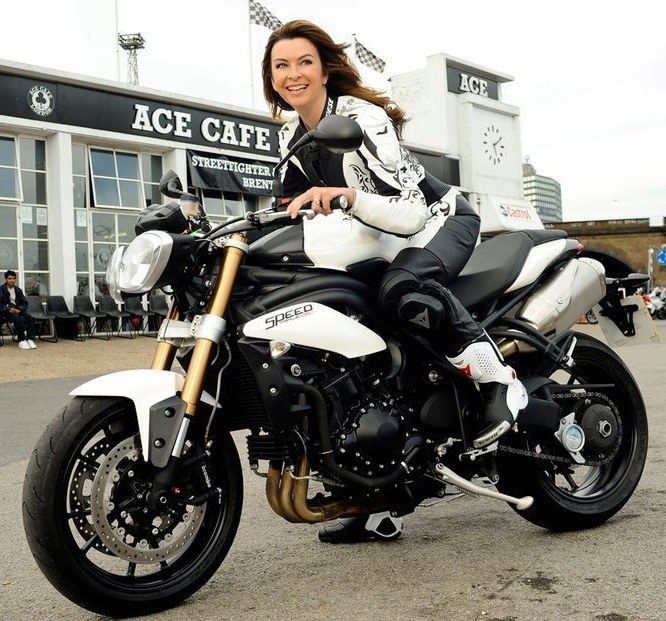 Looking at the latest model line up of Trophy, Tiger, Daytona and Bonneville that is surely the case! I’m proud my moto’s badge says “Triumph”. A sum of the parts. 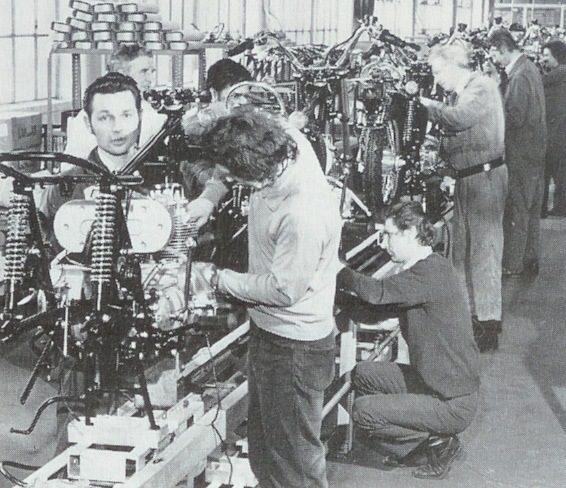 Assembly Required: here are a few evocative shots of the Meriden factory line where the 750’s are being built. The last embers of a decades long industry. A tough time for the strong British manufacturers; cars and bikes alike. Elbow grease and graft. Making products that go around the globe. The day after Christmas is of course the observed holiday for tradesmen, service personnel and other workers of the world (well in some Commonwealth related countries). 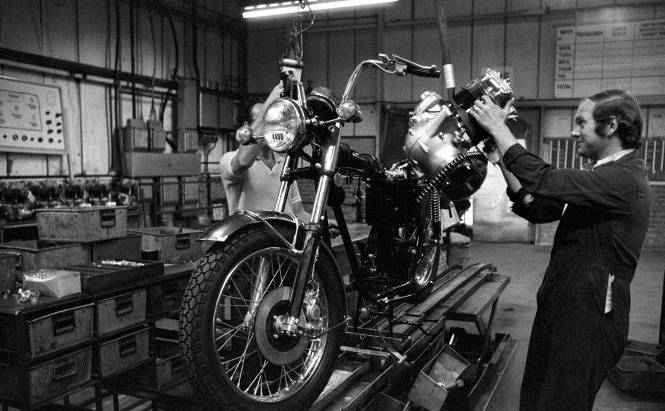 The day after that is all back to business for the grafters… Here are two nearly identical photos of a Triumph assembly line 3 decades apart; one lad is working on a 750 on a Meriden Co-op line, the other a beefy Thunderbird 1600 of more recent manufacture. 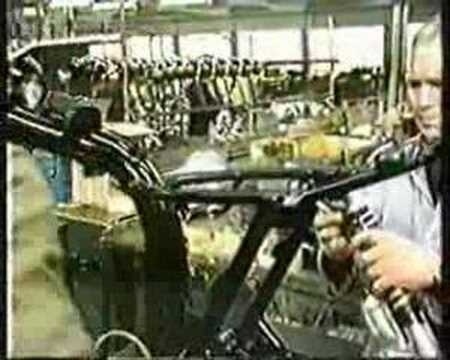 Factory life is an interesting aspect to review especially related to the British motorcycle industry. Next few days we’ll investigate. 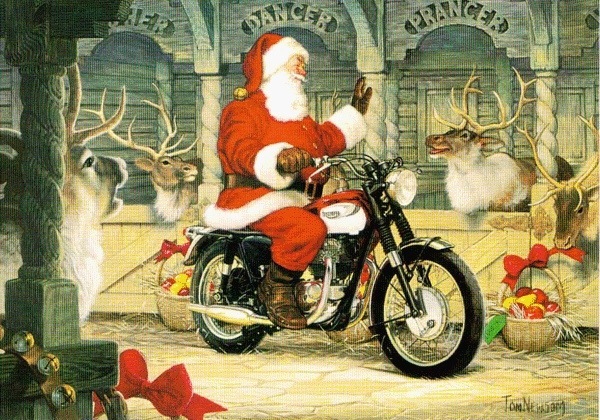 How else would Santy get about his stables than on a red Triumph Bonneville? Murray Walker that is! His enthusiastic voice rang out the excitement of motorsports for decades. Two as well as four! Unless you can also count the 6 wheeled Elf Tyrell F1 cars! 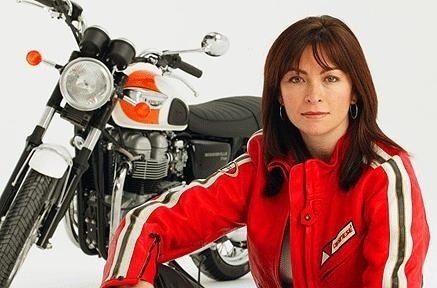 BBC reported today that the next Formula One season will be commentated by the lovely Suzi Perry who has been the voice for Auntie’s MotoGP for the last ten years. 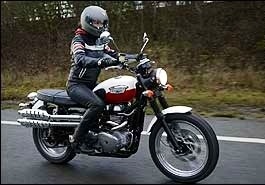 Well of course she is a two-wheeled MotoLady which includes a love of the old Triumph badged cycles. Scrambler ma’am: the utility bike for the damp British roads. 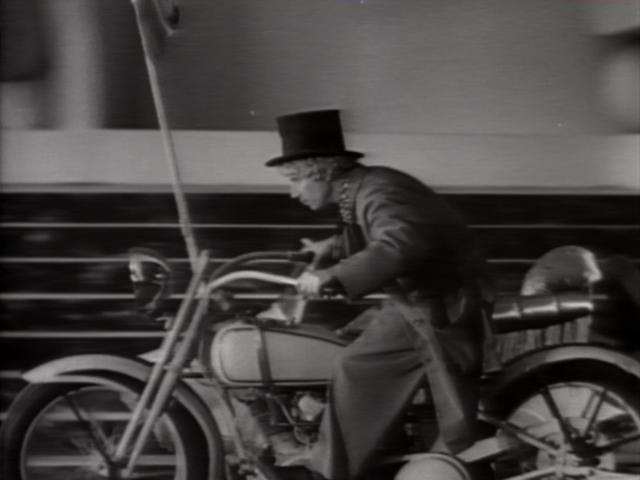 A blast darn the Great Nort Road to the Ace Cafe for a cup o’ tea! A Speed Triple is tge steed to be seen on! White leathers match Moto well! Bonnie Bonneville, a great choice for all! Big boots to fill giving voice to F1. Vintage Murray in the Janes Hunt days with Senna, Piquet and Mansell are legend! Another great invention of the British Industrial Revolution was the steam locomotive: it’s power to connect and move materials, goods and people about the country. 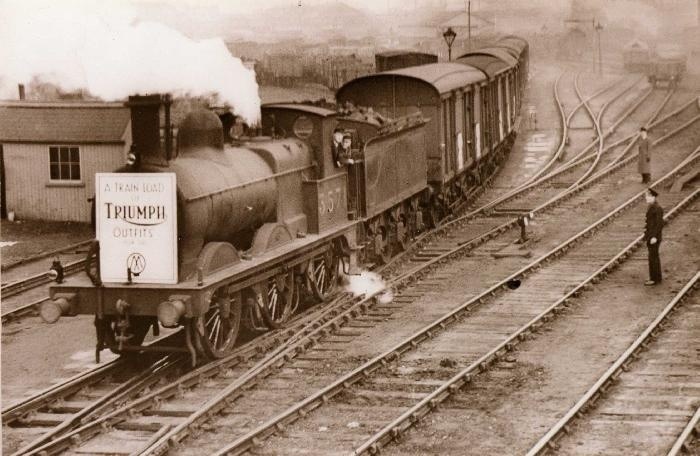 Here’s an early century photo of a train hauling some freshly manufactured Triumph outfits. This is a 0-6-0 Midland Johnson engine. One of the most widely made utility beasts of the late 19th -20th C. The last of these used into the 60’s; however none remain. Nevertheless British engineering at its best! In the forest of the night! 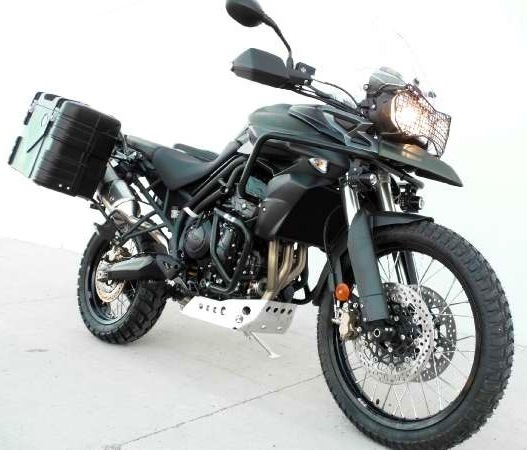 The latest iteration of the new model Tiger, an 800cc Moto ready for global action. Tall suspension, grand stance and rugged good looks; big cases tote adventurers goodies. This XC has ABS and a punchy triple engine, all rendered in a suitable drab green color scheme. 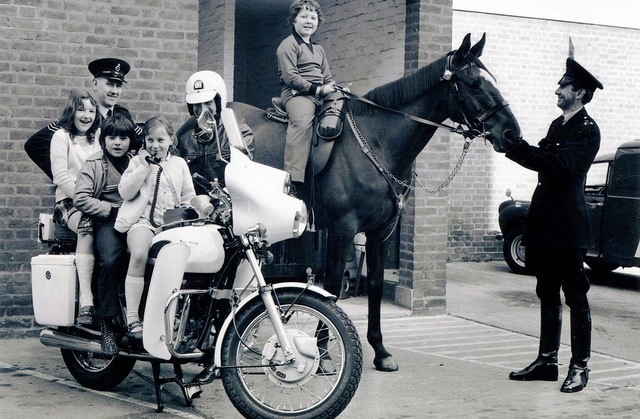 Four Legs or Two Wheels: if you join The Force you could get to ride either. 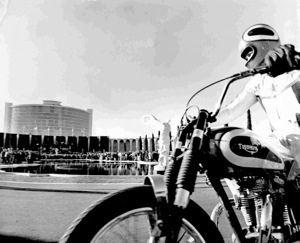 The 70’s Triumph set up with ‘blues and two’s’, tank mounted ‘phone and tall fairing give the Roz on a Rumble an imposing view of the traffic of the day. 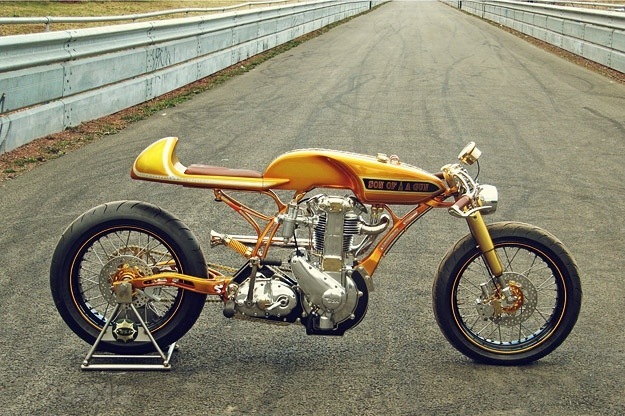 I can’t imagine giving chase at speed with that conical front brake! Cheery kids look like they’re having fun on both steeds while the local Bobby’s look on. You’re nicked sonny! We’ve been catching up on some recent Brit-TV of late; one show in particular has been a fun show to watch: George Gently. Based on novels by Alan Hunter and based in Northumberland and Durham it follows the exploits of London DCI from Scotland Yard relocated up North and dealing with the more backwater crimes of the Geordie vicinity. 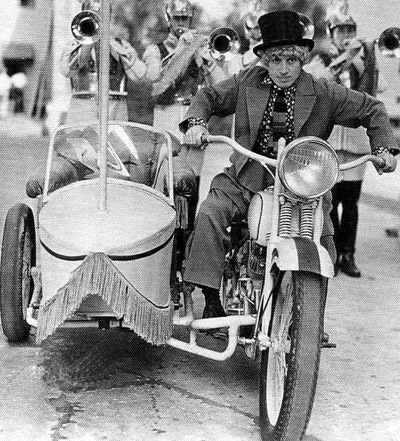 The first episode had a storyline revolving around a biker gang who tear around the countryside and towns on Triumphs & Beezas. 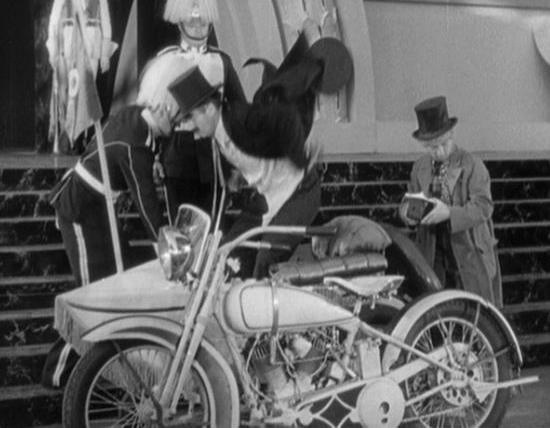 Indeed the ringleader, Ricky, has a beautiful featherbed fram’d, manx-tank’d Norton. An interesting note: The actor playing Ricky, Richard Armitage, plays the main dwarf character, Thorin Oakenshield, in the upcoming Hobbit film. Line, colour and shape: put ’em together just-so and visions appear. Here’s the classic lines of a ’68 Bonnie, considered by many to be the best of ’em! This online CAD drawing was downloaded then rendered in Photoshop.